AlphaE radon meter is an electronic handheld device for fast and time-resolved radon monitoring in buildings, outdoors and in mines. Typically, 80% of the final result is achieved after 2 hours (faster response for higher values). 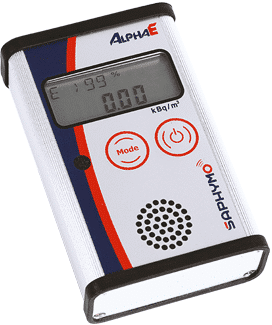 Due to its ultra-lightweight design and sophisticated features, AlphaE is also highly suited to survey personal radon exposure and doses in workplaces. The AlphaE’s favorable price-performance ratio makes it useful for service companies engaged in radon assessment and mitigation as well as for users in private homes. Up to 6 months of battery life allows for long-term measurement without mains power. Permanent operations via mains supply are possible via USB port. This ultra-small and light-weight instrument comes with an optional belt bag, an alternative for wall-mounting. Based on a silicon diode diffusion chamber, the sensitivity of the detector is 3 cph at 100 Bq/m³. 80% of the final result is achieved after 2 hours (faster response for higher values). Low radon levels below 100 Bq/m³ can also thus be measured as specified by the latest World Health Organization recommendations. The calculation of the dose is performed based on user-settable factors for equilibrium and dose conversion. Saphymo’s Radon product range provides monitoring tools for mitigation, expertise missions, and personal exposure monitoring for Radon risk assessment.